Bereft of a boat to float in, what do would-be boaters do…? Cleddau has been away from her mooring for over three months now. 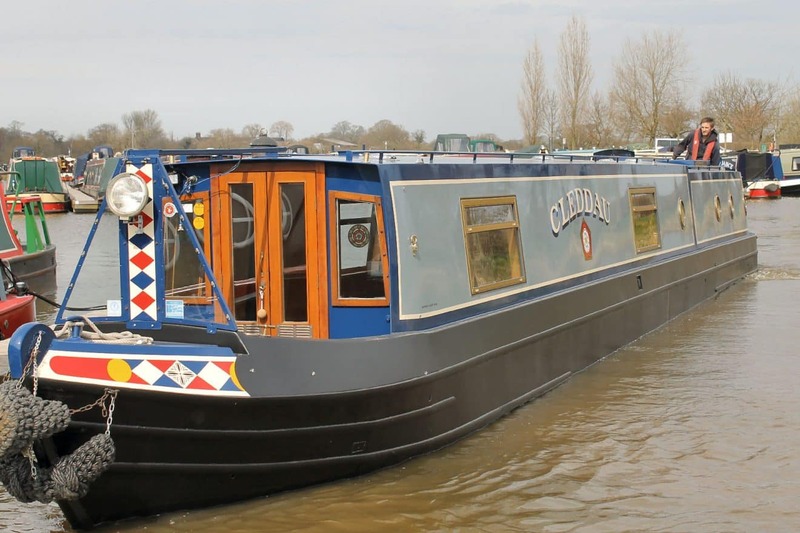 She was taken on a south westerly cruise in October, to Aqueduct Marina, near Nantwich. When last seen afloat she was a slightly sad looking picture, curtains gone from the windows, poles and ladder from the roof, herb pots from the rear cabin roof. Next seen, just after Christmas, she was out of the water, on blocks, awaiting improvements. Twice the Captain and Boatwif found themselves nearby and visited her, to pat her hand hull, as if to reassure her. By the second visit it was apparent that there’d been an initial operation, a shiny new bottom bearing down at the end of her rudder. Meanwhile, if not afloat, the Cleddau crew bent to the compulsion to be beside water. There was a bright though very cold walk beside the Goyt Valley reservoirs on Boxing Day. What lurks below the waters? according to this very useful website. At New Year the Great Ouse in Bedfordshire was running high. When walking round Priory Country Park a diversion via Cardington Lock is a must. Back in September the John Bunyan trip boat carrying sundry guests and a jazz trio had cruised smoothly through this very lock on a birthday trip downstream – but in late December the lock gates were open at both ends and walls of water were surging through. Then, in traditional post-Christmas fashion, the road stretched west to Pembrokeshire – and glimpses of the sea. Tides were low during the afternoons allowing for a bright and sunny walk at Freshwater East. At Freshwater West at low tide the massive empty beach stretches far ahead. High up on the peninsula road a sharp white shape could be detected. Known locally as The Rocket House (see history here) it is now let as a holiday cottage . Famed at Freshwater West is the Seaweed Drying Hut. Local women from Angle used to collect seaweed from the beach and leave it to dry for a week on the sandy floor of the hut; then it would be sent to Swansea to be made into laver bread… As ever, bracing breezes proved a good antidote to festive excesses! but the only boating activity spotted on the River Avon was a rowing four and a single sculler. The river level seemed fairly high though the flood gauge at the lock exit was marginally out of the red. to potter upstream to the Old Bathing Place – or maybe not… a moot point anyway given her current landlubber status! and Gothic revival architecture unite the building at the Colonnade which provides an easily accessible dock for transferring scenery and a pleasant space for audiences to promenade. From inside the building the new drum-like shape of the Royal Shakespeare auditorium is apparent. Back home the Captain pores over summer cruising plans and takes delivery of new flag holders for Cleddau’s roof, while, during dark midwinter afternoons, a post-Christmas jigsaw has amused and entertained. Jigsaw provider, Cheshire Mum, would no doubt prefer not to hear later this year real life tales of stranded boats, head on collisions or crew members overboard! Wonderful post as usual Sue. Hi Jaq! It’s February at last, that bit closer to getting back on board Cleddau…! We’ll seek you out when next we come up to visit the boat.